When we last left our heroes*, they’d just beaten down three guards and escaped from the “science tube” room where they’d been held in some kind of suspended animation. Rather than going out through the main exit that their mysterious ‘voice in the ear’ benefactor had provided them, however, they’d slipped out through a maintenance hatch that Angelia (Jadyn) had discovered, and were now crouching in a narrow passageway, next to an access terminal. “We’re on a ship?” Mikenna asks. So we talk a little bit about what the characters know about themselves and what they know about each other. I encourage really sketchy levels of detail. The kids determine that Angelia (Jadyn) knows both Mikenna (Malik) and Anna (Kaylee); Anna knows Angelia, but only knows of Mikenna; Mikenna recognizes Angelia, but doesn’t know Anna at all. Anna is eight, Angelia is 14 (a freshman who’s been taking high school classes for the last two years), Mikenna’s a junior. At this point, we stop to talk a bit more about Aspects and what they do. Once that’s covered, we talk about the High Concept aspect they all already have, and what the other Aspect ‘slots’ are for. Something I’m not talking about yet. I ask the players about Trouble Aspects and if there’s any sort of Aspects of their character that, while sometimes useful, tends to cause them problems more often than not. The kids, perhaps unsurprisingly, immediately get this concept. Kaylee already has one written down (Bites Off More Than She Can Chew, another expression of the character quality at the core of her first stunt), and with that example, it’s pretty easy for the other two kids to come up with something. Mikenna: Good with crowds, bad with people. I’m really happy with all three of these as Trouble Aspects. To be honest, they’re probably the best examples of these types of aspects that I’ve seen, let alone gotten to play with first hand; they’re absolutely doing their “first job” of giving me an easy level to pull that will reward the player with fate points, but they’re also actually useful – every one of them can be used to legitimately provide benefit in certain situations, and that’s so often not the case with Trouble aspects. We also take a look at the information they came up with earlier about each other, and look at relationship aspects. Jadyn already has one written on Angelia’s sheet (I look out for Anna), and based on that the girls decide that Angelia babysits Anna sometimes. Malik and Jadyn talk about their situation a little bit more, working out that Angelia is one of those kids that kids her own age don’t like because they’re taking advanced classes, and that older kids don’t like because the younger kid is showing them up. The kids work out that Mikenna is getting secretly, informally tutored on math and science by Angelia. None of them really remember what happened, or how they got where they are right now, or much about anything or anyone beyond the people they’re looking at, but they remember a little. A fascinating dynamic develops out of this, in that Angelia (the ‘middle’ kid, both in the game and at the table) is essentially the leader of the group. I’m happy with getting the trouble and the first relationship aspects down at that point, so when the kids struggle with their second relationships, I wave that off for later and move things along. “Okay, this is Oracle again,” say the voice in their ear buds. ‘Oracle?’ mouths Mikenna. Angelia shrugs. “I’ve been going over the schematics for the tunnels you’re in, and I think I’ve found a way to get you closer to one of the hangars, which should be the best way to get you off the ship.” The maintenance screen they’re crouched next to light up with a map, and a series of passages light up. “Follow this route, and that should get you almost all the way there without you needing to go back into high-traffic areas. The trio heads out, and traverse a fairly large distance without any problem (bypassing about a half-dozen rooms I’d sketched out encounters for and now discard, unmourned). Oracle brings them to a room with a round shaft leading down. “How about we slide?” say Anna, and creates a kind of ice platform anchored to the side of the shaft, steps onto it, and starts building the platform down like a large spiral slide. Pretty normal ice-guy thing, but new to the players, so we do some rolls to control the descent and keep from descending at an out of control speed. Meanwhile, Mikenna has pulled a line out of her utility belt, and is using it like a abseil/zip line, while Jadyn describes Angelia getting down by holding onto the walls of the shaft with her telekinesis and lowering herself that way. I point out that anyone looking at Angelia would think she was just flying down slowly. Jadyn says “I can fly?!? Cool!” and Angelia’s movement accelerates rapidly. We roll some dice to see how everyone’s new method of getting around works, and given the opportunity, all three kids decide to accent their ability with a Stunt. Jadyn can’t think of one yet, but knows she wants one. Because I can make ice-slides, I get a +2 to flashily overcome movement-related obstacles. Because I have a zip-line, I get a +2 to cleverly overcome Physical obstacles. The shaft opens out into a utility control room, and we’re sort of back to a room vaguely like a scene in the DCUO tutorial. 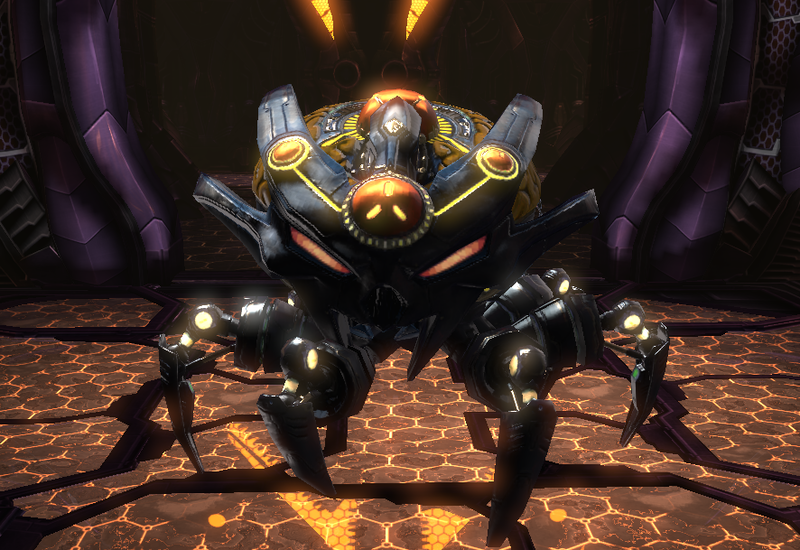 Anna (stealthily) creeps up, and reports a half-dozen “really big spider robots.” Basically these guys. Meanwhile, Jadyn has noticed that there are a couple warning lights blinking on the control terminals in the room. After working out what the lights are supposed to mean, she Cleverly deduces that the room next door is supposed to be where “Earth trash” is accumulated and destroyed, but all the delivery tubes for the room are currently locked, and the supply of various kinds of trash are building up in the massive tubes over the robot’s head. “What’s in each of the tubes?” Jadyn asks. And therein begins a plan. Thanks again. I look forward to reading through your other posts. Each of these posts is basically one play session, more or less. The sessions usually ran a few hours, never more than three – not as long as a session with experienced/adult gamers, but as long as everyone could manage. Planning… I based the general outline on the tutorial mission from DCU Online, and in general my notes are simply the stats I’ve shared and a basic outline of what game element I wanted to introduce in an encounter, if necessary. I like the adventure fractal, but typically I’ll just build something in the style of Mouse Guard: Challenge #1, with branching results from either success or failure.